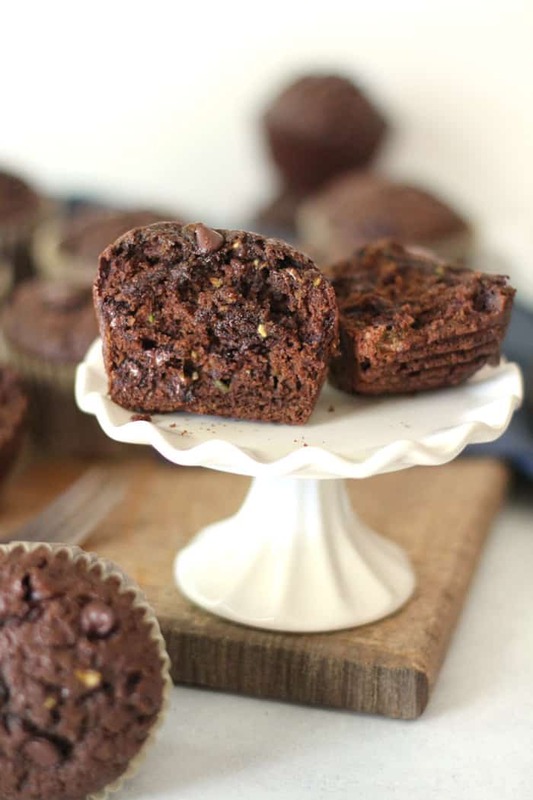 A deliciously decadent muffin, loaded with chocolate and freshly shredded zucchini. 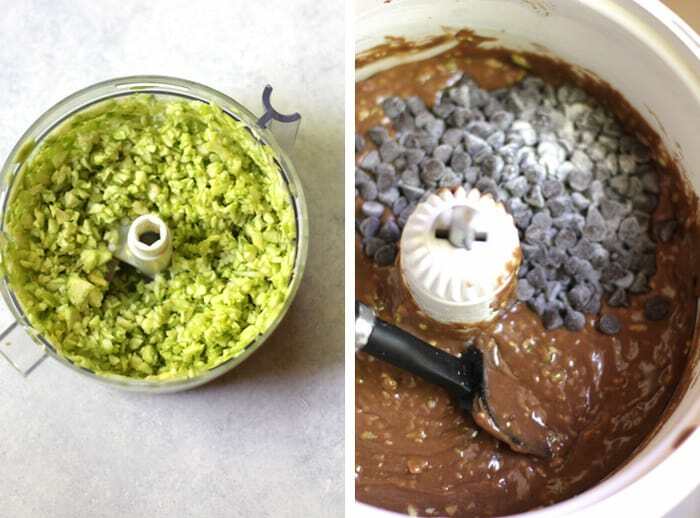 This one makes perfect gifts, and your friends are going to want the recipe! Another Norma Jean recipe from the archives, and this one gets a makeover. My mom loved baking, and this recipe was one of her regulars. She made gigantic muffins, and we could have one and not feel so guilty (for not eating two). We were known to eat them straight from the oven with a big dollop of butter, because that’s what Norma Jean taught us. Warm muffins, with a big shmear of buttah! That’s what I’m talking about. This is a perfect gift, in muffin form or even loafs! One year for Christmas, I made several batches of this, and made it into loafs instead of muffins. I gave a loaf to all of my girlfriends, with the recipe attached. It was THE recipe of the winter, and I’m sure I ate well above my quota that season. Yikes. If you decide to make loafs instead of muffins, you will need to up the baking time to close to 50 – 60 minutes. Just watch them closely, and take them out of the oven when the center is still just a tiny bit soft. Don’t over-bake. 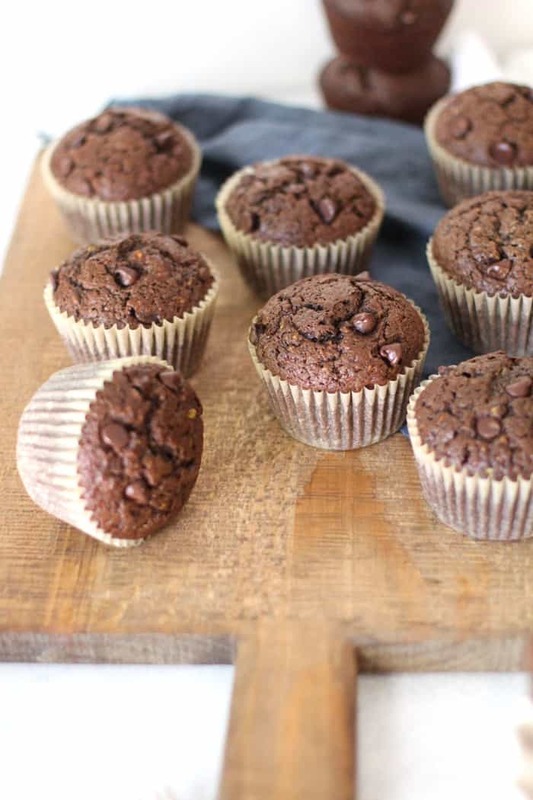 Tips for making perfect Chocolate Zucchini Muffins. Don’t skimp on the zucchini. That’s what makes them SO moist. Be careful when melting the chocolate to avoid burning it. I always cook for two minutes at 50% power in the microwave and then let it sit a bit before stirring. 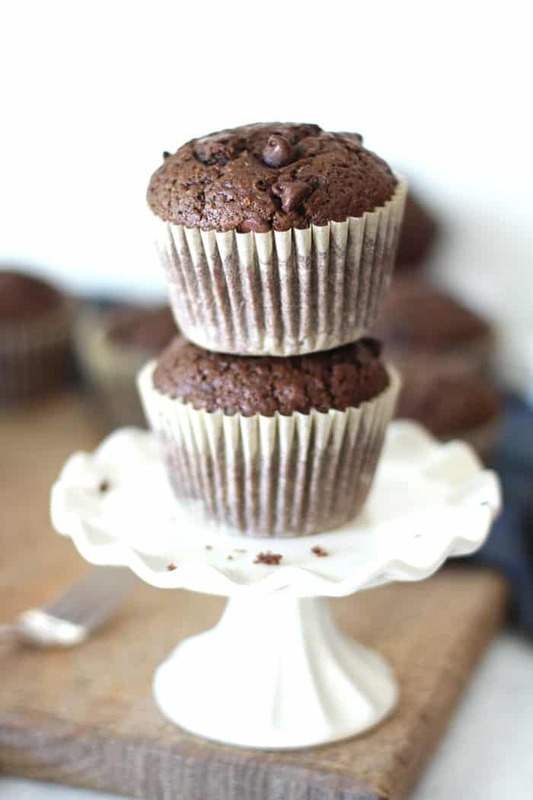 If you overcook it, it will be stringy and the muffins won’t be chocolatey. Add a teaspoon or two of flour to the chocolate chips before adding them to the mixture. This will ensure that all the chips don’t sink to the bottom of the muffins. I also added a few to the top for presentation. Watch the oven really closely when they are close to being done. We like the centers just a tiny big gooey. 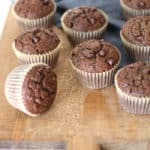 Make sure you use jumbo muffin tins so you only need to eat one! 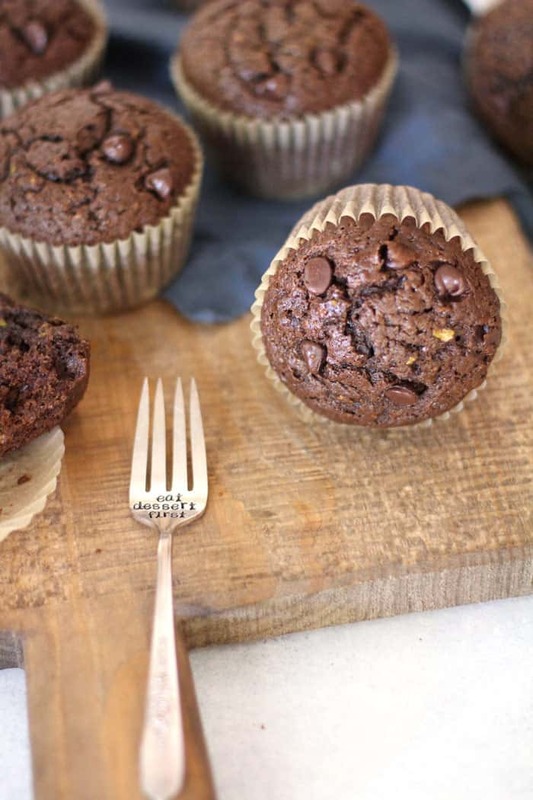 A delicious muffin combining fresh zucchini and decadent chocolate. Using a mixing bowl, add eggs and beat. Add remaining ingredients, except for the unsweetened chocolate and the chocolate chips. Mix well. Melt the unsweetened chocolate in microwave cooking it at 50% power for approximately 2 minutes, depending on microwave. Be careful not to burn! Add to mixture. Mix 2 teaspoons flour with chocolate chips to prevent them from sinking to bottom of pan and then add to mixture. Stir gently. Pour into extra large muffin pans that have been sprayed with baking spray (or use cupcake liners). Fill about 3/4 full. Bake on 350 degrees for 25-30 minutes or until toothpick comes out clean. Watch them very close so you don't over-bake. Mom used to put these on the table for breakfast, whenever we came home for a visit, and my mouth can taste them just thinking about it. Y’all have to try them! So delicious and “healthy”, which is a good reason to have more than one. These are excellent!!! This recipe is a keeper! Thanks so much! Thanks Christine! I’m so glad you like them! YUM! 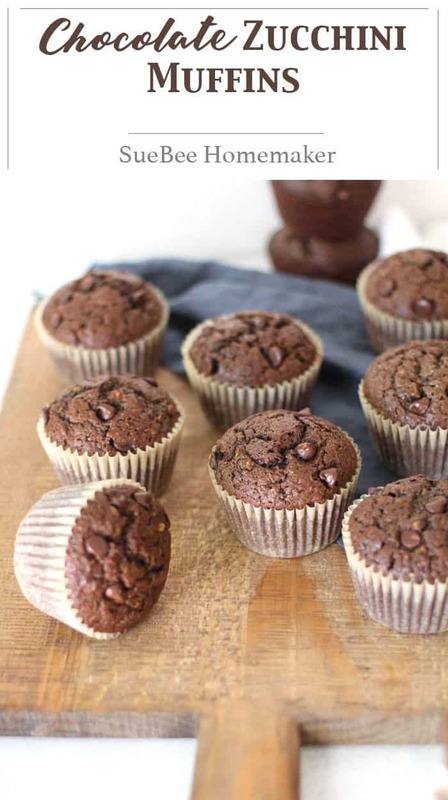 These muffins look so delicious and moist! These are the bomb and won’t last long! Get them when they are warm! OMG! Break out the elastic waist pants!! These are SINFULLY DELICIOUS!! !